I have been invited to share a few things about myself and I would be glad to do that. I was born and raised in St. Paul, Minnesota, attended the St. Paul Public Schools, the University of Minnesota, Minnesota Bible College, and Northwestern Lutheran Seminary, now part of Luther Seminary. I was ordained in 1977. Over the years I have served in both full time intentional interim and regular “settled” Calls. I have served in Wisconsin, Upper Michigan, North Dakota, Indiana, and Minnesota. 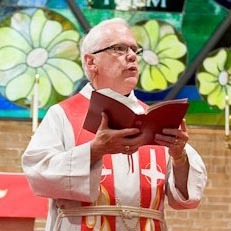 I have also served as Vice-Pastor over 15 times in my years of Parish ministry. I am presently serving as Visitation Pastor. I came here in 2009 to serve in an interim position while the congregation was looking for both a Senior and Associate pastor. I occupied the Associate Interim position which turned into a permanent Call. I am married to Cyndy. We have two daughters, spouses, and six grandchildren here in Wahpeton. I also have three children, spouses, and four grandchildren living in Wisconsin and Arizona as well as a son J.R. who lives in Bismarck. My Brother, Sister and their families live in the Twin Cities area, other family members live out and around Western, North Dakota and in South Dakota. This is a little about me. Life is full and good!